Come on over to my instagram feed @happinessblog3 to learn more! 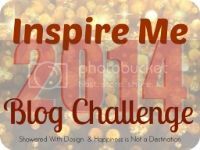 Now it's time to get down and dirty with today's Inspire Me 2014 topic! I was trying to think of gifts I've gotten over the years and couldn't really think of anything that was the worst. I've gotten gifts that I didn't really care for. The gifts that you have to open right in front of the person and give the fakest smile ever so you don't feel bad. But that's just me...things that I don't personally use but others do. So technically those couldn't be the worst. Then I thought about how I've gotten a nice sweater or something that isn't my size. That's always hard as well. When Brian and I first started dating and maybe for two years after, every time his grandmother would pick out an outfit for me for either Christmas or my birthday, she'd always pick like a small or something. I never said anything but the clothes obviously didn't fit. Bless her heart! It then came to me. I put it out of my mind due to the circumstances but I'll never forget it. I had went to a family party with an ex boyfriend. I feel like we did a yankee swap but because there were only a few of us there, the person that handed out the gifts kind of knew what she wanted to give each of us. I opened my gift and was startled to see that it was men's underwear. Um...what? At first I was confused and thought it might be a prank gift. Embarrassed was such an understatement. The woman finally got her composure from laughing so much and said that this was actually a gift for one of her sons for Christmas. At the time I was still young enough to not be as amused. So, I then got another gift. I opened it and it was a chia pet. I had never seen these before and had no idea what it was. I brought it home and looked it over but my parents and I are the type of people that like to stick with what we know and what we've done all along. This was something that I wasn't sure the benefit of. I'm the type that likes for something I get to actually have a purpose and I like to use it. So, this nice chia pet was put under my bed and that's where it stayed until we gave it away. So, it may have not been the worst gift but it wasn't as practical as I would have liked.